It was really cold last night and we didn’t sleep well due to the heating system not working properly. I was getting odd readings on the system management panel. We looked to be very low on battery power which we need to run the fan on the heating system. This seemed odd as we should have had full batteries following our long journey from Zion. I couldn’t run the generator as its use is restricted to between 08:00 and 20:00. The only thing I could do was shut the system off completely. Worse still, we were short of fresh water due to false readings of the tanks contents back at Zion, probably because we were parked on a slope at the time, and there were no functioning fresh water taps here to top up the tank. We arose at 05:50 after very little sleep to walk to Sunset Point where we would watch the sun rise over the canyon. After a brisk walk we arrived and to our surprise there were already quite a few people there; we must all be mad, we could have all stayed in our nice warm beds. 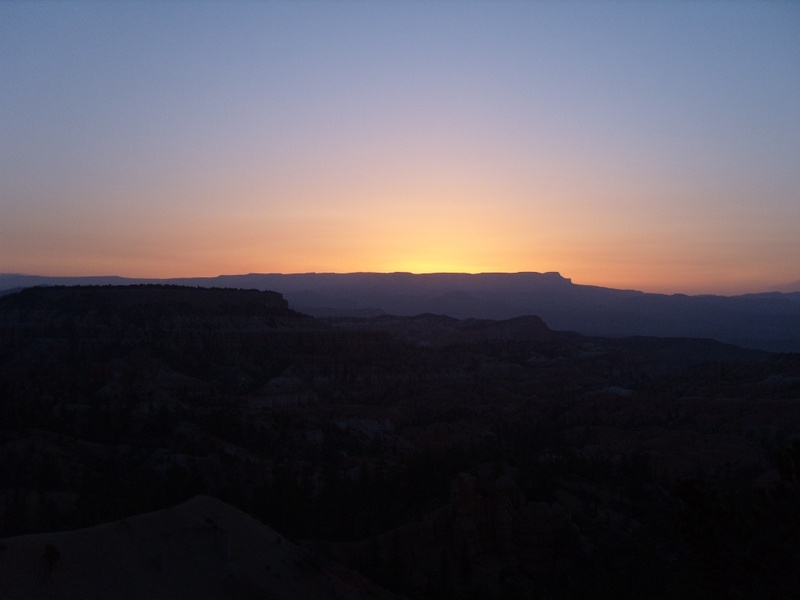 Rosina joined the throng at the point and I walked further along the canyon rim for a quieter view of the sunrise. This is the problem with video photography; you catch the sound of other people and conversation on the soundtrack as well as the video image. I have from time to time covered the microphone with my finger to try and overcome this problem. The sunrise was beautiful and well worth the effort. Having enjoyed it we made our way back to the RV, and on arriving at the campground noticed a heavy frost covering the cars, to say nothing of the small ridge tents, they’re hardier folk than us that’s for sure. I’ve camped one way or another for many years, from ridge tents, to frame tents, to trailer tents to caravans but I’ve always found that very cold or wet weather always took the shine off things. Back indoors we now felt even colder than we did when we got up. It was still too early to run the generator which would have given us the power we needed to use the heating system, and most certainly too early to ‘get up’, and so we didn’t, choosing instead to get undressed and go back to bed. When we finally arose the first thing I went for was the generator ‘start’ button on the control panel. We then had power and heating, though it did take us a long time to warm up properly. 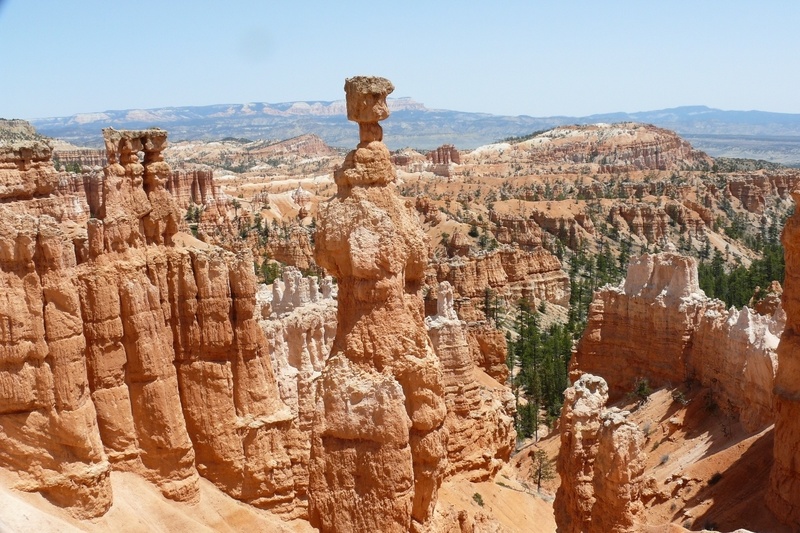 The plan for today was to hike the ‘Queens Garden’ and the ‘Navajo Loop’ trails down in the canyon, a total of about 4 miles. We were to have set off after breakfast returning by lunchtime avoiding the need to carry food with us. Unfortunately because of our ‘lie in’ we set off about two hours later than planned carrying only cameras and water. The walk was absolutely spectacular. During the hike every twist and turn bought a new perspective to the landscape, which, unlike the Grand Canyon was more human-scaled, you can not only see the bottom of the canyon but can walk down to it, and get back up again independently and within a reasonable time scale. We finished our drinking water, but were feeling hungry which was too bad, there was nothing to eat until we got back to the RV. In future we will be carrying breakfast bars which will ensure we have convenient access to food rather than relying on a packed lunch. By the end of the hike we could feel the heat from the sun on the back of our necks, and although we enjoyed the hike immensely I think we were both glad when we’d completed it. On the way back I accosted two Rangers driving around the campground intending to moan about the lack of a dump station facility. They explained that the reason it was closed was because the ground was still frozen, in fact they’d had snow here only two days ago. There was no evidence of it, but it did explain why the facility wasn’t available to us. Back at the RV we relaxed for a while. I decided to wander down the road and have a chat with our duty campground hosts at their motorhome regarding the best route from here to Monument Valley. I had a route in mind taking in the most scenic roads, (Utah12 North, Hwy24 East, Utah95 South, & US191 South) but it did involve many miles on a ‘Pass’. The Chef only has so much strength in her hands with which to grip her armrest, and I was concerned that the route using the Pass could cause us problems. It’s not like back home where, if you’re not happy, you just change direction. On many long roads out here, once you’ve committed to a route, that’s it, go back the way you came or soldier on. Our duty hosts told me they had never been down that particular route nor knew of anybody who had ever done so which didn’t fill me with confidence. What if nobody had ever met anybody who had returned from taking that route? It could be the ‘Utah Triangle’ in which RV’s mysteriously disappear. Having discussed it with The Chef we decided to take the much longer route using US89 North, I70 East and then dropping down in to Moab and heading south in to Monument Valley on US191. I started the fire in our Fire Pit/BBQ with some screwed up freebie newspapers we’d retrieved out of a dispensing machine in Las Vegas, kindling wood which Rosina had gathered yesterday, and some pine cones, boy they burn well when they’re dry. We enjoyed a real barbecue of chicken drumsticks and thick, juicy steak. The taste was really good, even the ‘charcoal’ improved the taste. We had gathered so much wood, pine cones and wood bark that we didn’t even open the bag of logs I’d carried on my shoulder all the way back from the General Store. I could only run the generator for a short time this evening having forgotten about the 20:00hrs curfew time. Our lack of battery power was causing me concern, things had never been this bad before and I wondered if something was turned on and draining the batteries. By late evening we both smelt of campfire smoke. 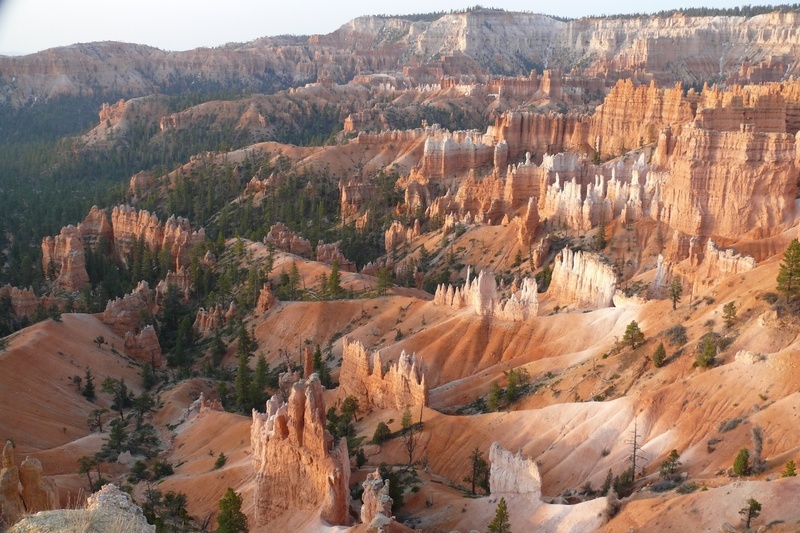 LOCATION TONIGHT: North Campground, Bryce Canyon National Park, Utah. Today we experienced an ‘American’ Tunnel, as opposed to a ‘Swiss’ Tunnel. 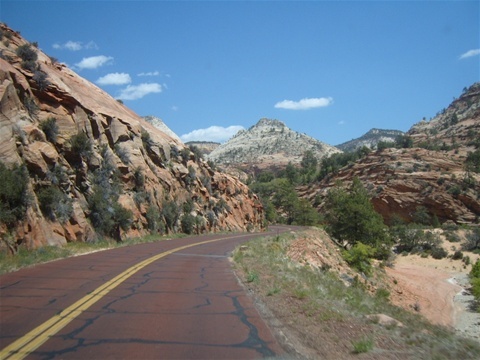 On leaving the campground we had to re-enter Zion National Park and pay $15 for the journey through the tunnel which has height and width restrictions. The journey to the tunnel was up a long, narrow, very steep road full of switchbacks (hairpin bends) and no crash barriers, with a long drop if you get it wrong. Out of the corner of my eye I could see The Chef's left hand firmly gripping the armrest once again. I must admit I didn’t enjoy the trip up nor the trip through the single carriageway tunnel as I was concerned that if I strayed too far to the left or right I’d take the roof off the RV. Why ‘American’ Tunnel? Rosina observed that the Americans build a twisting narrow road that climbs high and then build a short tunnel through the mountain near the top, whilst the Swiss would have gone straight through the mountain at its base. The scenery once we were through the tunnel was very picturesque, eventually becoming very fertile, rural countryside within a valley with a river running by the side of the road. When we refuelled en-route I decided to treat the RV to some 89 octane petrol as opposed to the usual 87 we’d been feeding her on. She certainly seemed to run sweeter on it and I was happy to spend that little bit extra as we were continually asking her to do an awful lot of climbing. As we approached Bryce Canyon National Park www.nps.gov/brca the scenery became very dramatic and we were full of anticipation. On arrival at the main gate we paid our entrance fee and then went to the North Campground which was just through the gate, and opposite the Visitors Centre. It was from here that the shuttle buses would take us through the park. We drove slowly around the campground looking for a suitable pitch. There weren’t too many vacant ones that could take our length of vehicle but we eventually managed to find a spot right next to the pine forest. We went for a walk and after about 250yds or so there it was, a most wonderful view of the canyon below. We continued our walk towards Sunrise Point, logically one of the best places to view the sunrise. On the way we spotted a building set back in the forest and decided to investigate, it turned out to be the General Store, which, according to our map should have been much further away. We then realised that the scale of the map we were using suggested that everything we wanted to see was within walking distance. After a look around the store I spotted a sign which said they sold logs for campfires. I asked what time they closed and they said 8 o’clock. I told them I’d be back for some firewood after we’d had our walk. On reaching Sunrise Point we checked it out ready for the morning and then returned to the store where I bought one netted bag of logs for $4.95 plus state tax of course, and up on to my shoulder they went. On returning to the RV I scrubbed clean the black steel Fire Pit/BBQ, at the same time thinking how odd it was that the very organisation which preaches the dangers of forest fires, provides each pitch with a log fire and BBQ facility. Once it was clean The Chef and I went skirmishing for small pieces of wood and pine cones. We collected lots before deciding to try out our repaired BBQ grill tonight and use the Fire Pit/BBQ tomorrow. After enjoying the ‘barbie’ I lit our gas-powered campfire which we then sat by for a while admiring the clear starlight sky until it became too cold for comfort due to a cool breeze blowing, not helped by the fact that we were at an altitude of 8,000ft. Before going to bed I set the hot air heating system to 15C as a precaution against a cold night.